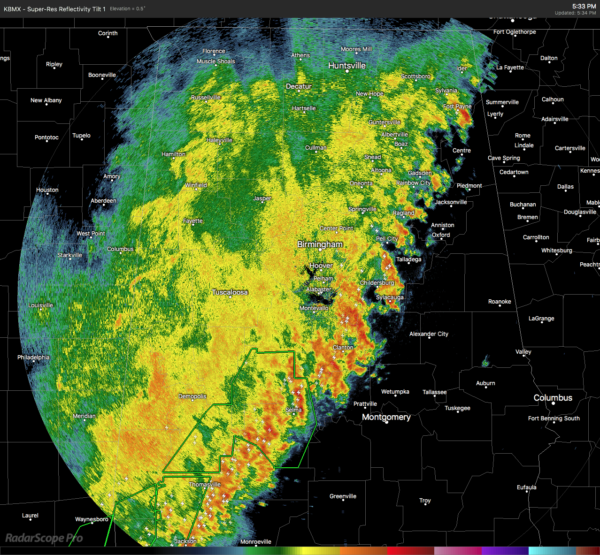 The leading edge of the line of storms have reached the eastern half of the state, stretching from Fort Payne to Sylacauga to Selma. No severe weather warnings are in effect at this point, but a Flash Flood Warning was just recently issued for Dallas, Marengo, and Perry counties until 9:30 PM. 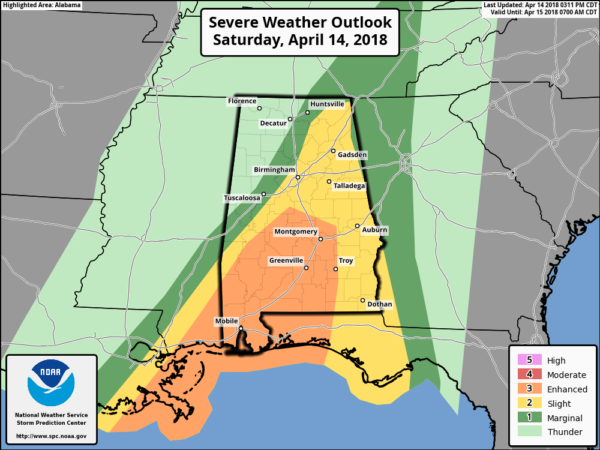 The good news is that the severe weather threat has diminished for just about all of the western half of North and Central Alabama, with the exception for locations in Dallas and Perry counties. The bad news is that a threat of flash flooding will exist well into the night for areas west of a line from Gadsden to Montgomery. hours, mainly east of a line from Gadsden to Childersburg to Selma. 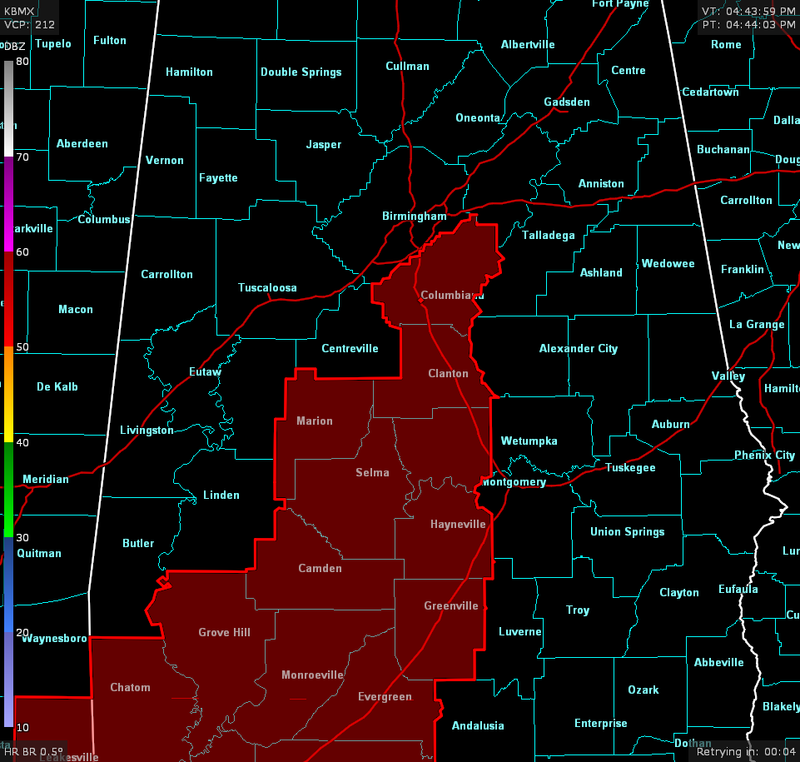 The threat will diminish from west to east and should exit the eastern parts of Central Alabama by midnight. 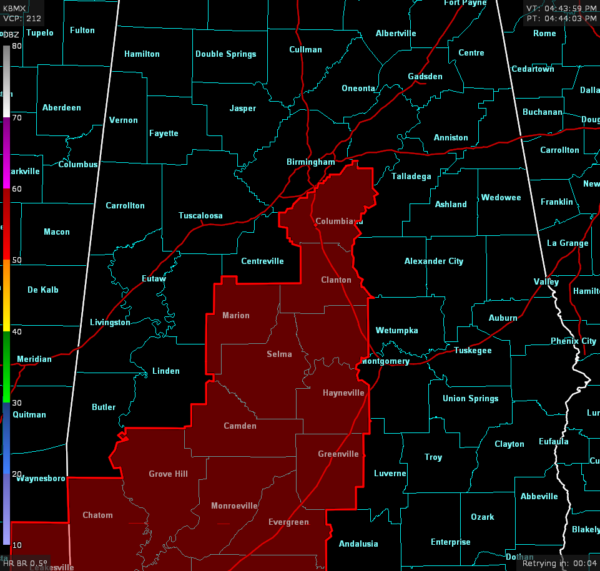 NWS Birmingham continues a Tornado Watch until 7:00 PM for Autauga, Chilton, Dallas, Lowndes, Perry, and Shelby counties. A Flash Flood Watch also continues in effect until 1:00 AM Sunday for Autauga, Bibb, Blount, Calhoun, Chilton, Coosa, Dallas, Etowah, Fayette, Greene, Hale, Jefferson, Lamar, Lowndes, Marengo, Marion, Perry, Pickens, Shelby, St. Clair, Sumter, Talladega, Tuscaloosa, Walker, and Winston counties. Rainfall amounts of 3 to 4 inches could lead to isolated flash flooding into tonight. The main window for strong to severe storms throughout the area will be from now until around 12:00 AM Sunday, mainly for the east-central and eastern parts of the area. For the east-central parts of the area (Montgomery, Alexander City, Anniston), the window will be from now until 9:00 PM. For the eastern parts of the area (Auburn, Troy, Eufaula), the window will be from 7:00 PM until 12:00 AM.